Doing the newspaper for the past 15 years has taught me a lot about risk, effort and reward, not to mention abysmal failure. Also, that in-between state so familiar to small businesses – the grueling grind of barely getting by. We just don’t earn enough from ads and paper sales to keep the newspaper going, so once a year we call upon the community to help us out, with an auction. People have always enjoyed our annual Eye Ball. Arcata people are decidedly social creatures, and almost any semblance of a soirée will draw them downtown. And when the roster of performers is saturated with A-list local celebs, the response is overwhelming. Initially we had the Eye Ball in the Plaza View Room. While 15 years doesn’t sound like a lot, one year’s Eye Ball featured a skit by the late Randy Collenberg involving a then-hot scandal – that of Bill Clinton and Monica Lewinsky. Later we switched to E&O Bowl, and there are many warm memories of Eye readers and kids bowling up a storm there. We’ll be back there again. But once the Arcata Theater Lounge opened, that seemed like The Place To Be. And with its capacious stage, much more merriment – visual and auditory – became possible. And, as it turns out, the fabulous entertainers of our land are as eager to make a spectacle of themselves as the party-partakers are to behold them. At this point, we seem to have established some ATL-Eye Ball traditions. A basic requirement of the Eye Ball is some magical confoundment. That was supplied by Shantaram the Magician the first year, and last year by the amazing Steven Weven. This year we have International Superclown Shea Freelove deploying a small subset of his clownish cavorting. Our friends at Dell’Arte will be back this year, as will those fetching Rutabaga Queens and Pom Pom Queens/Eye Dolls. And it wouldn’t be an Eye Ball without the gorgeous gals of the Eureka Sisters of Perpetual Indulgence. Along with being Eye candy, so to speak, the Sisters handle the auction chores with glamorous aplomb. For the first ATL Eye Ball, the estimable Rick St. Charles hosted. Last year, it was KSLG superstar John Matthews. This year, Arcata’s bike-tastic former Mayor Bob Ornelas is Master of Ceremonies. This year’s amazing band line-up is: Rob Amerman: guitar, vocals; Kelly Brannon: drums; Pete Ciotti: guitar, drums, vocals; Dan Davis, bass; Andrew Goff: guitar, keyboards, vocals; Kelly Hoover: keyboards, guitar, vocals; Kevin Hoover: drums; Josephine Johnson: vocals; Marla Joy: bass, sax, vocals; Mark Lovelace: guitar, vocals; Terrence McNally: vocals; Wolf Navarro: guitar, vocals; Rick Park: guitar, vocals; Hank Sims: guitarrón, vocals; and Ross Rowley: bass, vocals. The term “must-see” springs rather readily to mind. 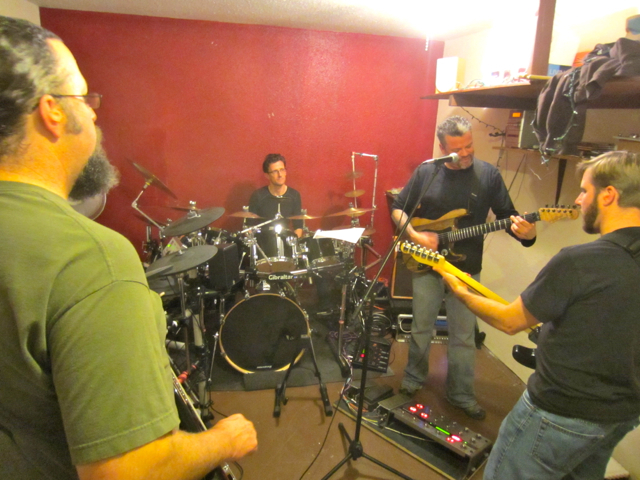 Two weeks ago, an initial core group (pictured above) got together for the first time, and were instantly able to cobble the bones of several songs, including “Living After Midnight,” “Back In Black,” “Fat Bottomed Girls,” “Ain’t Talkin’ ’Bout Love” and “Green-Eyed Lady” – yes, the Sugarloaf song! My main task will be to stay out of these wonderful musicians’ way. I’ll be documenting the progress of the Rockestra as the days count down to the 15th Annual Arcata Eye Ball, Saturday Feb. 18. This entry was posted on Friday, January 27th, 2012 at 9:22 am	and is filed under Scene. You can follow any responses to this entry through the RSS 2.0 feed.